Schilt Publishing, 2014. 176 pp., 69 color illustrations, 7½x9½". 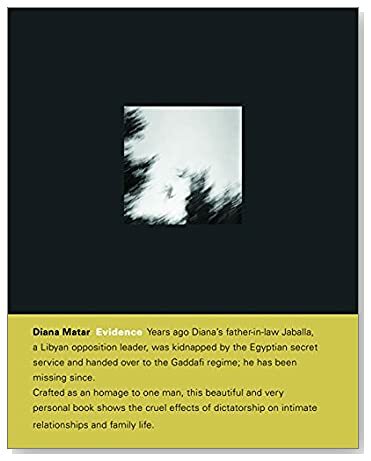 Evidence is the cumulation of six years work on political disappearance by the photographer Diana Matar. Years ago the artist's father-in-law, a Libyan opposition leader, was kidnapped by the Egyptian secret service and handed over to the Gaddafi regime; he has been missing ever since. 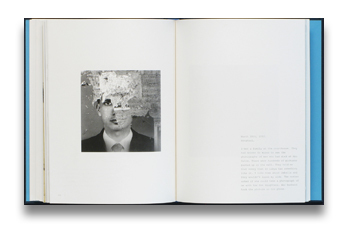 The first third of the book is a meditation on absence told through photographs and excerpts of letters written by the artist to her missing father-in-law, Jaballa. Slowly the book begins to change as it is made clear that Jaballa's actions have implications for her own life and her family's safety. As she travels through London, Libya, Italy and California, the images and diary entries take one on a journey through contemporary history. Crafted as an homage to one man, the book shows the cruel effects of dictatorship on intimate relationships and family life. This item is currently unavailable from photo-eye, however we have located copies for you to purchase immediately through Amazon or Amazon Marketplace. We will receive credit for these orders if you use our ordering system. We will also receive credit for any other purchases you make while on Amazon's site. Thank you for supporting photo-eye!